While on the promotional trail for his much-praised new sci-fi film The Martian, Ridley Scott has previously revealed that he is planning on making three more sequels to his 2012 Alien pseudo-prequel Prometheus, and now in an interview with HeyUGuys, he has let it slip what he plans to call the first sequel… Alien: Paradise Lost! Shaw’s Father: Everyone has their own word; heaven, paradise. Whatever it’s called, it’s someplace beautiful. Young Shaw: How do you know it’s beautiful? The new planet to be featured in Alien: Paradise Lost, which will be the home of the nefarious engineers of the first film, is said to have been dubbed “Paradise” by the filmmakers. Although Scott has previously confirmed the original H.R. 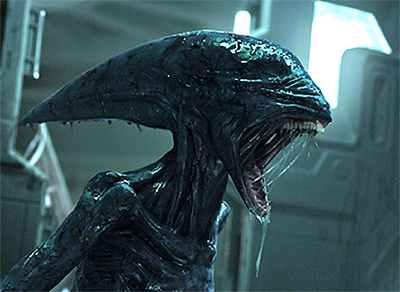 Giger Alien designs will not be replicated for this new film, it should involve new terrifying creatures, including the engineer/alien hybrid dubbed “The Deacon” as glimpsed briefly in the finale of Prometheus. Alien: Paradise Lost will go before cameras in February with Michael Fassbender and Noomi Rapace set to reprise their roles of Shaw and the android David, respectively. Looks like Blade Runner sequel may be called Androids Dream. Domains incl. https://t.co/T1P8GXrrpY registered by company used by Warners. During the same interview in which he announced the new Prometheus title, Scott also confirmed that whatever title the film goes under, it will still carry the familiar title. “You don’t want to lose the title ‘Blade Runner’ but I think it’ll be ‘Blade Runner’ plus something,” Scott said. The Blade Runner sequel is scheduled to start principal photography in summer of 2016. Hampton Fancher (co-writer of the original) and Michael Green have written the original screenplay based on an idea by Fancher and Ridley Scott with the story taking place several decades after the conclusion of the 1982 original. Harrison Ford will reprise his role as Rick Deckard with Ryan Gosling previously said to be in talks for a role. Denis Villeneuve will direct the film with frequent collaborator Roger Deakins working as director of photography.